On Monday, she talked to the PBS NewsHour’s White House correspondent Yamiche Alcindor at the annual South by Southwest festival in Austin, Texas, where she avoided confirming or denying whether she will run for the highest office this cycle. She also suggested that Democratic challengers focus less on the current occupant of the White House and more on the policies that the party stands for. Abrams, Georgia’s 2018 Democratic nominee for governor, came about 50,000 votes short of winning in the traditionally Republican state, and many Democrats have pointed to her campaign as a potential roadmap for engaging new voters. In the months since, Abrams’ influence and vocal advocacy for voting rights has vaulted her to new heights in national politics. She was chosen by House Speaker Nancy Pelosi and Senate Minority Leader Chuck Schumer to deliver the Democratic response to President Trump’s State of the Union address, becoming the first black woman to do so. In her forthcoming book, “Lead from the Outside: How to Build Your Future and Make Real Change,” Abrams writes about a spreadsheet of goals she began in college and has periodically updated. When Alcindor asked her about what the spreadsheet says for 2020, Abrams laughed off the speculation. 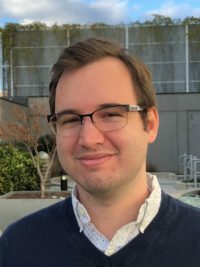 “You think you’re clever,” Abrams said. “I see you, Yamiche.” Abrams has previously said she will make a decision about her political future by the end of March or early April. 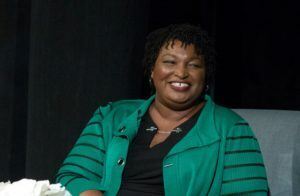 Abrams was the first black woman to be the nominee of a major party for governor and has spent much of the past decade registering minority voters. She dismissed criticism from some who say Democrats are talking too much about race in politics. “It’s disingenuous for us to pretend that race isn’t embedded in the way we construct our politics as a nation,” Abrams said. “It’s disingenuous for us to pretend that race isn’t embedded in the way we construct our politics as a nation,” Abrams said, pointing to the institution of slavery, and the rise of the KKK and white nationalism. She also offered sharp criticism for the president’s rhetoric and actions in office. “Do you think Trump is a racist?” Alcindor asked. Abrams, who won more than a quarter of white voters in Georgia — 4 percent better than Hillary Clinton’s presidential campaign two years earlier — said she talked about the same issues with white and black voters, including the economy, education and law enforcement. Alcindor noted that Abrams writes in her recent book that “affairs of the heart perplex” her. The NewsHour correspondent asked if that is still the case. Abrams recalled the moment when two different dating services denied taking her on as client due to her weight. Abrams said her appearance has been routinely criticized on the campaign trail. After Abrams lost in November, she founded Fair Fight Georgia to advocate for election reform, combat voter suppression and turn out minority voters. Abrams said her gubernatorial campaign focused on making sure all voters knew their vote was important. “If you’re in a marginalized community, you’ve seen politicians come and go, and your life does not get better. Therefore you need to be persuaded the whole system matters,” Abrams said.